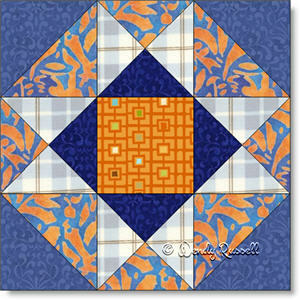 The Swamp Angel quilt block is an adaptation of the Ohio Star block. By switching up the corner patches (from squares in the Ohio Star block), your design becomes a little more complicated, but still easy to sew. Squares, half square triangles and quarter square triangles are the only units used in this block. Depending on how the quilt blocks are laid out, the focal points may be the stars or even on the secondary pattern that may emerge as you set the blocks side by side. You can see how this works by examining the illustrations for the sample quilts.